Generally when a book is called a classic, either it has stood the test of time for many years, centuries in most cases, and has had a significant influence on our culture and even language, or it is a recently published book that the publisher is trying to promote. George Orwell’s 1984 has not been around for centuries but considering the huge effect this book has had, it might be fair to call it a classic almost from the moment was published. If I say a word like Big Brother or double-plus good, or a phrase like Oceania has always been at war with Eurasia, any English speaker will know instantly what I mean, even if they haven’t actually read the book. I have just finishing rereading the book. Although 1984 is one of my favorite books, it has been some years since I have actually read it all the way through. With most good books, you get something new out of the story with each rereading and I have found that 1984 is no exception. There are a few things I noticed which I hadn’t really thought much about before. I noticed that Winston Smith is not a very good judge of character. It seems that his impressions of almost everyone he meets in the story are misleading. He believes Julia to be a sexless fanatic, O’Brian to be a covert member of the Brotherhood, and it doesn’t occur to him that the kindly, old Mr. Charington might be a spy for the Thought Police. He imagines that his neighbor Parsons is too stupid to be arrested for thought crime, you have to actually have thoughts, I suppose. With that in mind, I wonder if the impression Winston has of his estranged wife, Katherine as being “goodthinkful” is really accurate. He couldn’t admit the nature of his own heretical thoughts with the telescreens always monitoring them and the strong possibility that she would instantly turn him in to the Thought Police. Maybe she had similar thoughts about Winston. Winston is also a bit of a wimp. He and Julia spend their lives assuming that they will eventually be caught by the Thought Police, they will be tortured and they will confess to imagined crimes. They seem to be unable to contemplate any way of avoiding this inevitable fate. When the Thought Police arrest them, Winston never tries to flee to fight back. Granted, any attempt to fight the Thought Police would be futile, still he might have done something other than standing still and waiting for them to hit him. In the holding cell, when the voice from the telescreen tells Winston to be quiet or not cover his face, he complies. Why? What would they have done if Winston told them to “F— off”? Torture or shoot him? He really didn’t have anything to lose at that point. I don’t think it was cowardice on the part of Winston Smith. Although he hated the Party and all it stood for, he was still very much a Party man and he accepted their basic premises and discipline. This is similar to the way the Old Bolsheviks that Stalin purged willingly signed confessions to imaginary crimes and humiliated and degraded themselves at the show trials. They were tortured and worn down by the NKVD, to be sure, but they had spent their whole adult lives under the discipline of the Bolshevik Party and when the party told them to sacrifice themselves, they lacked the inner reserves to refuse. I imagine that someone outside the Party would have a better chance of resisting the Thought Police, especially of such a person followed a competing ideology, perhaps a devout follower of some religion or a fervent nationalist. I believe this was often the case with the victims of Stalin’s torturers. Winston Smith believes, throughout the book, that someday the Proles will rebel against the Party and overthrow them. O’Brian assures Winston that this is nonsense. Since the uneducated Proles have no knowledge of any circumstances but what they are familiar with, they cannot know just how miserable and oppressed they really are. This is precisely why the North Koreans have never attempted to rebel against their government. Until recently, they had no knowledge of conditions outside of North Korea and could easily be led to believe that life in North Korea was better than anywhere else. But, even if the Proles did learn that people in the past were freer or more prosperous, or perhaps that Eurasians or Eastasians were better off, they still could not do very much. Successful revolutions require some degree of organization and the ability to fight. The Proles could not organize without attracting the attention of the Thought Police and they have no guns or other weapons. They might be able to riot, but rioting is easily suppressed. They could not overthrow the Party. On the other hand, O’Brian boasts to Winston that the rule of the Party is forever. I have to wonder about that. The purges described in 1984 could not really continue forever. Along with Winston, virtually every named character in the book who is not an agent of the Thought Police is arrested and presumably shot in the end. Who is going to replace these people? At some point there simply wouldn’t be enough people to keep the machinery of government functioning. This is why Stalin was obliged to ease up on the purges after a few years and why his successors never attempted to purge the party on such a disastrous scale again. At some point, Big Brother or his successor would have to scale back persecutions and allow a small amount of freedom of thought. Winston Smith’s job involves “correcting” newspapers and books so that the Party is always right. It seems like a lot of effort to recall every book and newspaper in every library throughout Oceania to keep changing the text so that the Party’s propaganda can never be proved to be false. I am not sure how they could possibly be sure of getting every single copy for alteration. Surely there must be old books on some forgotten bookshelf somewhere or old newspapers that were used to wrap something decades before and forgotten. Actually, Winston’s job would be a lot easier with today’s technology. As information is increasingly digitized and put online, all Winston would have to do is rewrite the stories on news websites. Unless someone happened to have an older version cached on their hard drive, no one would ever notice any alteration. Nineteen Eighty-four takes place in the area around London, England. I wonder what the rest of Oceania is like. Goldstein’s book hints that Oceania has a very decentralized economic and political system. It may be more a loose confederation than a very centralized state the way real Communist countries like the Soviet Union or the People’s Republic of China are. The official ideology of Oceania is supposed to be Ingsoc or English Socialism. I wonder how much that would go over in North America. Maybe there the ideology is called Amsoc or American Socialism. Or, since Americans have never cared for Socialism of any sort, maybe just Americanism. Maybe instead of Big Brother, Americans are warned that Uncle Sam is watching them. Maybe in Australia the ideology is called Ozsoc. Of course, we shouldn’t take it for granted that anything that the Oceanian government says is actually the truth.It may well be that Oceania is actually an isolated state like North Korea consisting only of the British Isles. Eurasia and Eastasia along with the entire war could simply be fictitious. Winston Smith has no way of knowing and neither does the reader. I have to say that in general, George Orwell was not a very good prophet. 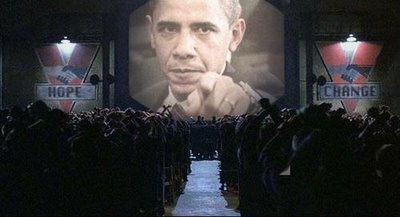 After all, 1984 has passed almost thirty years ago and we are hardly living in a world of perpetual war with a tyrannical government that is watching our every move. Wait a minute. Come to think of it, we kind of are.